Factora is the best WordPress Theme specifically made for some sectors like industry, Factories, Construction, Engineering, Machinery Business, Commodity Business, Power, Rail Business, Airplane, Ship Business, Oil & Gas Business, Petroleum websites. Not only for big sectors you can also use Factora for your startup. You also have drag & drop page builder which you can use to create and rearrange content easily with WPBakery Page Builder. Also you can quickly recreate a website similar to our demo site in minutes with one click import demo content. You can create stunning slides with different animation effects easily with Revolution Slider. 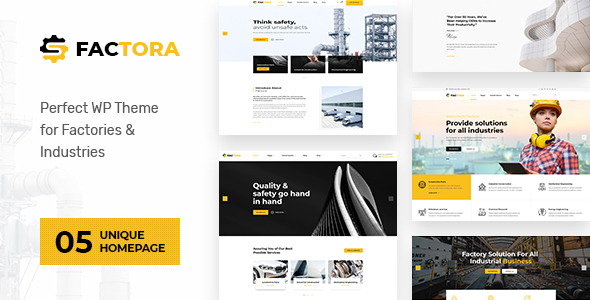 Factora – Industry, Factory Business WordPress Theme comes with all necessary features for your online presence like portfolio,blog, testimonial and personal profile page etc. Factora will be the best choice for individuals, startup Industries and corporates. Install Factora with our powerful one click installer. Get your site up and running in no time! Quick, easy and rocket fast!. Look of your website on mobile devices is very important these days. So we made sure Factora looks great both on mobile, desktop and retina screens! Factora is compatible with most popular WordPress plugin that supports creation of multilingual layouts. Translate your website to any language with WPML! Factora is compatible with the most powerful and most popular custom contact forms WordPress widget! create your own forms in seconds! Factora enables you to easily override default template files using a child theme. It also enables you updating your theme in the safe way!